In the summer of 2013, a long-armed Dan Arechabala played a pickup basketball game against a group of guys at a parish, all hailing under 5 foot 8 inches. Dan played defense on one player who hadn’t made a basket that game. The player dribbled down the lane, picked up the ball for a layup, then dribbled again when he saw Dan. The player continued to the three-point line and drilled his first shot of the night to end the game. Dan was ready to let it go, but his teammates weren’t. “You said travel,” teammates said. “Yeah, I did,” he said, but he did let it go and the game was over. Arechabala saw the man several times in church afterward, but he wouldn’t look at Dan or return his attempts at acknowledgment. That ability to relate attracts people to Rev. 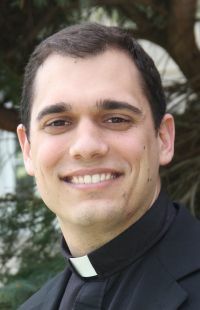 Mr. Daniel Arechabala, soon to be ordained a priest for the Philadelphia Archdiocese. 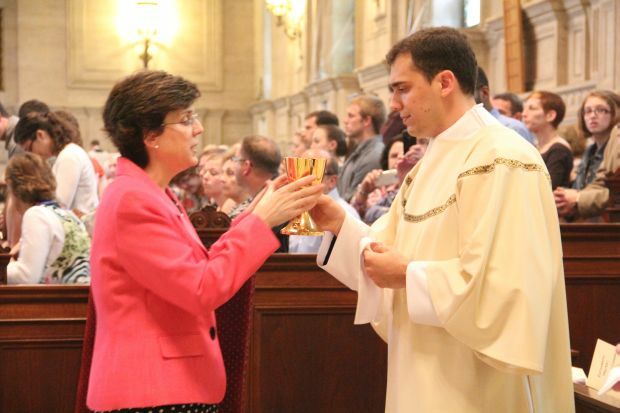 He and his six other classmates will be ordained Saturday, May 16 at the Cathedral Basilica of SS. Peter and Paul, and his first Mass will be Sunday, May 17 at 11:30 a.m. at Mother of Divine Providence Church in King of Prussia; Father Patrick Welsh will be the homilist. Arechabala first experienced the call to priesthood at a young age. As a 5-year-old, Dan turned to his mom at Mass and asked why the priest used a plate instead of a bowl for the paten. The call continued as a teenager, when Arechabala wrote a letter to God, who called him to the priesthood, but Dan wanted to experience the world. Arechabala dated intermittently in high school and attended seven proms between his junior and senior year. In and out of relationships, he usually ended them, except for one girl who broke up with him during his senior year. Mary Beth saw him struggling with the call throughout high school. Several months after the breakup when Arechabala attended Franciscan University of Steubenville, Ohio, he and the girl talked over the phone as friends, as she explained her decision to end the relationship. When Arechabala applied for college St. Charles Borromeo Seminary in Wynnewood was on his mind, but his parents wanted him to delay a year. At that point in his life, Dan remembered his parents had misgivings about the seminary. 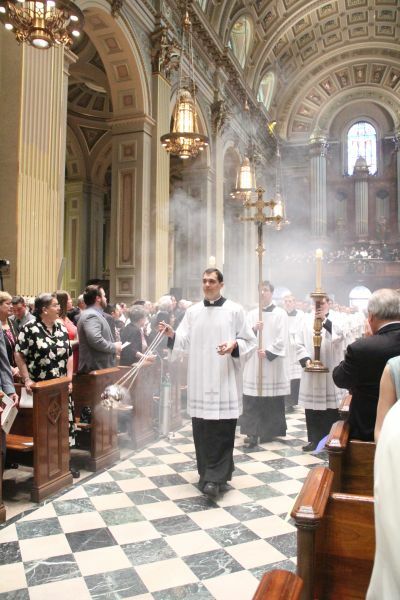 If not a priest, Dan planned on learning a trade, like his father, and raising a family. His parents, though, were adamant about him going to college. His mother thought he needed better perspective and more life experiences. After Dan’s relationship during senior year, he didn’t date again. He made a personal vow not to date for a year in front of the Blessed Sacrament. “Mom, if I was gonna meet anyone that I wanted to marry, it would’ve happened at Franciscan because there’s such a wonderful, holy group of women there,” Mary Beth recalled her son saying. Those 12 months turned into eight years. When dating crossed his mind, he took a step back and again affirmed his commitment to become a priest. And that letter he wrote as a teenager proved somewhat prophetic, encapsulating continued anxiety between living in the world and dying to it. It was a tension he continued to experience while in the seminary. To him this signifies fulfillment, not emptiness. Welcome to the Parish Father Dan! I look forward to working in ministry here with you. Great article. As a fellow parishioner of Mother of Divine Providence in King of Prussia…the Arechabalas provide a genuine, spiritual leadership so needed in today’s world. Dan will be a great priest!